One of the businessmen I work with is an avid fan of the popular TV Show ” The Big Bang Theory”. He is an advanced learner of English and in his free time enjoys challenging himself by watching various TV programs in English – a quite difficult task depending on the show he decides to throw into his Blue-Ray player! With a little prompting from him I got my hands on a transcript of a 20min episode and took some time to analyze it with a teacher’s eye on language. I was not surprised to see that there were plenty of cultural references, idioms, challenging metaphors, spoken language conventions, and slang being used. What I was surprised at was the amount of them! Let me share some of the results I found with you – please note that I am sure I missed some things within the script, though I did my best to actually analyze the language in the episode! (This involved a printed transcript, highlighters, and lots of coloring!) Being a fan of the show and having a copy of the episode on iTunes also helped keep everything in context. I looked at a recent episode from season 6 – episode 15 – named “The Spoil Alert Segmentation” which aired in the US on February 7th, 2013. 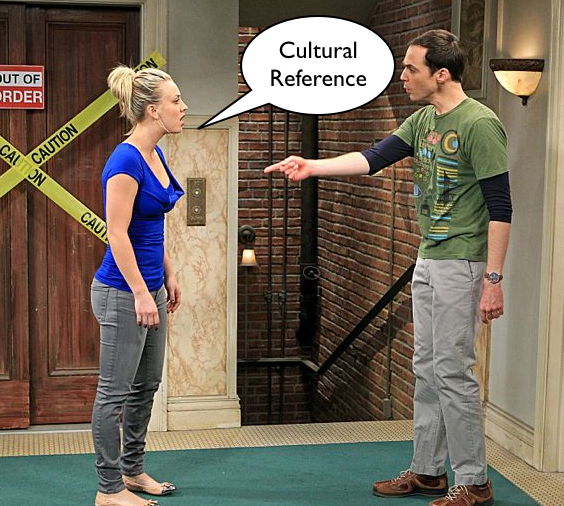 Cultural References : At least 18 – that’s a cultural heavy reference coming up at minimum one time every minute and 11 seconds. If one is unaware of the reference, one would “miss” the joke or have problems following the conversation. Context clues can often help… but the reality is that background knowledge of these things help. A learner listening to this episode in English will find these as obstacles slowing down understanding. Did you know all of those?? Even as a Native Speaker we might not be aware of all of them, but obviously these present challenges for our language learners out there in the world! Phrasal Verbs : At least 33 – this is a low number as there is a good chance I missed a few… and just what exactly counts as a phrasal verb & where to count them might alter the number a little. Many of these phrasal verbs would cause trouble in understanding for a language learner. What to take from all of this?? Native Speakers: Watch out for all of the above! Clearly we are talking about a TV show in English, so everything said was appropriate for the audience – however, should you find yourself in an international business situation, watch out for using expressions like the one’s listed on this page. Though they are colorful and surely show your fluency they also present obstacles for your business contact trying to understand you. Non-Native Speakers / English learners: The more you know about the culture of a language, the easier the language will become… so learning such expressions can always help. However, when you encounter such an expression be sure to ask the speaker to clarify what they mean – not only will you learn something new, but you will also make the speaker more aware of their own language. Questa voce è stata pubblicata in English of Native Speakers e contrassegnata con Big Bang Theory, Big Bang Theory English lesson. Contrassegna il permalink.